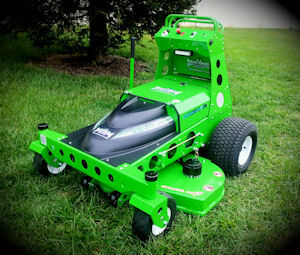 Made in the USA, the new, patent-pending STALKER stand-on walk-behind mower is powered by Lithium Energy Modules (LEMs). The 48-in. cordless mower can mow all day on one charge for most contractors, the company says, noting that if needed, LEM swaps can be easily accomplished in less time than it takes to add gas to a gas-engine mower. Quiet and lightweight, the STALKER offers more than 350 ft.-lbs. of torque per drive wheel. The “NIGHT STALKER” version (with LED floodlights) is also available. 1 Comment on "Mean Green Mowers: STALKER"